For most pet owners, sharing your bed with your Pomeranian is second nature, you have no problems and you both love it. However, there are reasons why your Pom should have a bed in which he can sleep. If your Pom always sleeps in your bed, he’s more likely to face hurdles when he’s left alone all day. Because he won’t be accustomed to having naps and/or resting in that new bed, his own bed, he’ll often find it hard to settle in his playpen or gated area when it’s daytime. This may create feelings of anxiety and separation. As a small dog breed, Poms can have toilet accidents and/or may fall off your bed or you might even roll on top of him while asleep. The more access your Pom has to your bed, the greater the risk will be that he wets the bed, soaking through the mattress. Qualities of the Best Bed for your Pomeranian. It must have proper support. A top priority when choosing a bed for your Pom is the necessity for good support. Because he’s small, many owners might not know how important it really is. Stress on a body is related to his size. When your dog rests, his mattress should curve to provide the right support for his body and ease any joint pressure. Your mattress is far to thick from being ideal in thickness thus causing the correct support for your pet’s body, being such a small breed. Your Pom must also have good cushioning for on his elbows or they may stiffen and feel sore, as well as have a thinning of the fur on his elbows. If you have a senior Pomeranian, it’s vital that his orthopedic bed is made from memory foam. The correct size to provide security. Pomeranians generally have an almost overwhelming desire to feel secure and safe. They love nestling up to you to feel protected and this is what helps most Pom pets become fully relaxed. The bed you buy for your beloved Pom must be the right size for him. Pomeranians vary in what they prefer in their bed. Some like a flat surface while others prefer it to be elevated. Your beloved pet may like bumper pads for his head. Regardless of preference, your Pom needs his bed to be a quiet retreat so he can slip inside quietly, not making a fuss or allowing others time to help him. In his space he can rest and sleep away from noise and other animals, rest comfortably and get good quality sleep. High quality material to stop contact friction. Many things can affect your pet’s coat such as: arid Winter air, the hot Summer sun, the type of bristles on the brush you use, and ingredients in his collection of washing and cleaning products. Contact friction occurs when your Pom’s coat rubs against various surfaces. Surfaces can only be gentle or rough and the intensity will vary, sometimes a little and other times a lot. 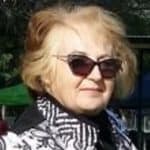 If it’s a rough texture and the contact is prolonged, the coat can be badly affected, causing static, split ends, a frizzy texture and other issues. 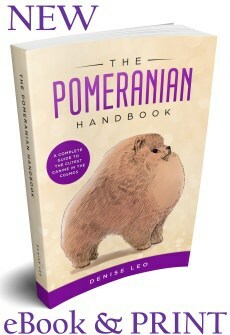 An unspayed female Pomeranian, while in a heat cycle, usually “flow” for a minimum of two weeks. Although Poms may only produce a light, barely noticeable flow, it’s still something to watch for and then clean when necessary. If the bedding doesn’t get cleaned with soap and hot water, it’s very unhygienic. Your dog’s body creates natural oils within his body 24/7/365. Every few weeks, the bedding needs a wash due to the oil build-up. Your dog must be washed every 3 – 4 weeks to prevent dirt and oils from accumulating. This is the ideal time to wash his bedding too. As your Pom sleeps, miniscule amounts of these oils will sink into the bedding. Eventually it will begin smelling, either a musty smell or a weird sweet and sour smell. Food particles, dust, dirt and debris will affect his bedding and needs a wash so the bedding becomes hygienic again. Recommended good quality bumper beds. 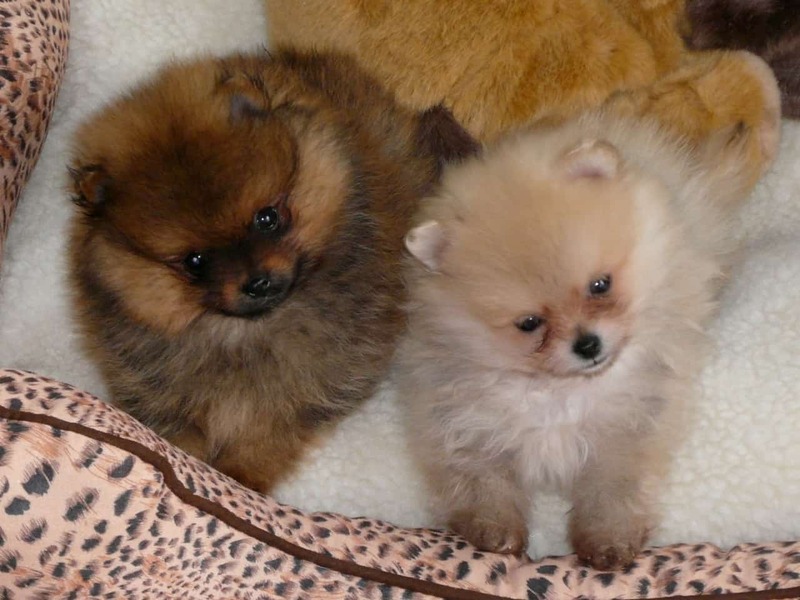 Lots of Pomeranian adults and puppies feel safe, comfortable and secure in a bed that has raised sides. Beds’ mattresses are extremely supportive. If your Pom of any age has problems with hips and/or knees, choose an orthopedic-style bed as it provides joint support, eases pressure and helps your dog get better quality sleep. These beds are ideal for any age Poms because you can’t spoil your dog too much when it comes to comfort and health. You can have a bed with low or high bumpers and even a flat mattress if your pet loves sleeping and relaxing on your floor. There are times when a dog is best suited to an atypical bed. Some prefer being raised up from the floor, ideal in Summer when air flows beneath them. A raised bed is a great method of allowing your Pom to relax in while enjoying the outdoors. Your Pom might prefer to be raised so he’s level with your bed. If so, a raised indoor pet house is probably he answer. Ramps and steps for human beds. If your pet sleeps in your human bed with no problems, that’s fine. However, you must be wary of how your Pom gets up onto your bed and down again. Buy steps for small dog breeds or a ramp if your dog is a senior and you’ll help your Pom feel safe when trying to get up to you or down to the floor. Fun Pomeranian Clothing. Do You need to Dress Your Pom?